Built to perform in extreme conditions, SanDisk Ultra® microSDXC cards are water proof, temperature proof, shock proof, X-ray proof and magnet proof**. Please note: this product is shipped without retail packaging. Transfer speed of up to 48MB/s**. ** Approximations; Results and Full HD (1920 x1080) video support may vary based on host device, file attributes, and other factors. *** Based on 4.1GB transfer of photos (avg. file size 3.5MB) with USB 3.0 reader. Results may vary based on host device, file attributes and other factors. 1MB=1,000,000 bytes. **** See www.sandisk.com/proof for additional information and limitations. † Full HD (1920x1080)video support may vary based upon host device, file attributes and other factors. 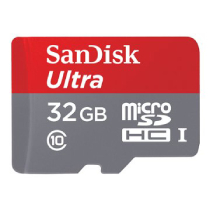 See www.sandisk.com/HD . ‡ Approximations; Based on 4.1GB transfer of photos (avg. file size 3.5MB) with USB 3.0 reader. Approximations; Up to 48MB/s read speed; write speed lower. Based on internal testing; Results and performance may be lower depending on host device, interface, usage conditions and other factors. 1MB=1,000,000 bytes. Memory Zone app lets you auto-manage media and memory for peak phone performance**. ** Up to 48MB/s read speed; write speed lower. Based on internal testing; performance may be lower depending on host device, interface, usage conditions and other factors. 1MB=1,000,000 bytes. † Full HD (1920x1080) video support may vary based upon host device, file attributes and other factors. See www.sandisk.com/HD . †† Download and installation required; see www.sandiskmemoryzone.com .